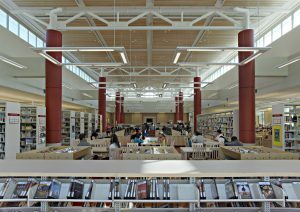 The Public Building Commission of Chicago (PBC) received the Construction Industry Service Corporation (CISCO) 2011 Pride in Construction Award for the Engine Company 109 Firehouse and the Little Village Branch Library in the New Construction – Chicago category. The PBC accepted the award at CISCO’s Annual meeting held on January 27, 2012 in Schaumburg. 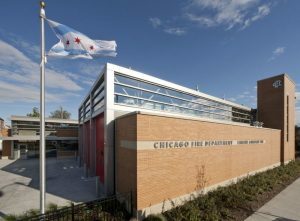 The new Engine Company 109 Firehouse and the new Little Village Branch Library share a campus site on the 2301 block of South Kedzie in Chicago’s Little Village neighborhood. The facilities’ adjacency provides an anchor for the community as well as a unique opportunity to implement a combined wellfield geothermal system and other sustainable site features, resulting in a showcase of integrated green design and shared opportunities. The combined undertaking budget value for both projects was $30,704,876. To date, the projects are trending $4,292,654, or 13.98%, under the original undertaking budgets. The PBC implements a strong economic sustainability program for each project it takes on. This program includes bid incentives for the employment of apprentices, minority and female workers; community hiring and resident workforce requirements; and contract provisions that require minority- and women-owned business participation and local business participation. The construction of the Engine Company 109 Firehouse and the Little Village Library projects has created over 80 Full-Time Equivalent (FTE) jobs, and almost 900 individuals have worked on these projects to date. And, of the total construction contracts awarded for this project, over 30% has been paid to date to minority-owned businesses and just over 6.5% has been paid to date to women-owned businesses. These projects also featured 18 community hires, as a direct result of PBC contract requirements and oversight. The Public Building Commission of Chicago manages construction and renovation projects for the City of Chicago and its sister agencies. Mayor Rahm Emanuel serves as the PBC’s chairman. Erin Lavin Cabonargi serves as the Executive Director of the PBC. Additional information about the PBC and its projects can be found at www.pbcchicago.com. You can also follow the Public Building Commission of Chicago on Twitter: @PBCChi and on Facebook.